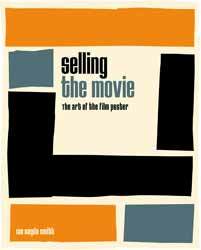 Selling the Movie by Ian Haydn Smith (2018, White Lion Publishing for the Quarto Group) is significant not only for its triumph of anthological content, the history of the film poster and its enduring function of selling the movie but also for its resolute pride in being that ‘old fashioned’ thing we’ve left behind: the bound book. Yes there is certainly a digital edition but this subject cries out to be a book, a big book, what has been deprecatingly called a ‘coffee table book’ - an artefact to be seen but not really explored. This book is meant to be held in one’s hands for prehensile touching, moving eyes in close to study elements of composition. Paper posters may almost be artefacts already in this age of streaming and photonic plutocracy but this writer thinks its damned appropriate to drink in these images on their original vessel, the primary medium of its historic art: paper. Over a century of cinema is catalogued here. Decade by decade. One begins to see the aesthetic Geist of each era cannily used to communicate the story, psychology, character and intention of the film. The commercial artists, some of whose names are lost to us today, had the challenge of grabbing you with that thing worth a thousand words: the picture. Even the words on the poster are servants of the pictorial cause as is emphatically clear with the sizzling full page repro (many, many more full pagers follow, making STM worth the price for that alone; the colour and print quality are state of digital art resplendent) facing the title page; what better way to illustrate the whole layer cake of functionality than with Quentin Tarantino’s Pulp Fiction? The rasty cover, gnarled from much handling. There are words on this poster but they dissolve into a blur around Uma Thurman. Her cigarette and automatic pistol get more attention than the cast names when we’re able to jerk our eyes away from her. But fluttering glances down the cast roster further intrigues us, leading off with John Travolta (what the fu..? It’s his comeback, man. Oh, okay.) all the way down to the caboose ('and Bruce Willis'). Knowing the early ‘90s status of everybody we immediately have questions, curiosity. Uma herself, Amanda Plummer, Maria de Medeiros (who’s she? I don’t know but I think I’d better if she’s in this company) and Rosanna Arquette. Samuel L. Jackson, Harvey Keitel, Tim Roth, Ving Rhames, Eric Stoltz and Christopher Walken. This is heavy stuff on a wrinkled, cheap old magazine cover, a dime novel no less. Too much information. Best to go back to Uma’s hypnotic stare. There’s no comfort but she might speak off the page to you and assault you with some answers. The art is meant to capture and it does. Seeing this process, experiencing it again and again, unpacks a century of thinking about film. Haydn Smith balances on the slack tightrope between obscurantism and introduction for art and graphics historians, those familiar with the enterprise and those starting into the waves for the excitement of their first surf. His prose is clean and his terminology contextualized and accessible. Yet his allusions to the aggregate effect of this whole body of art infuse the book with a lifetime of theoretical value. His text is worth a million words. The images he shares, a billion. Buy this book. If you have to go both ways and buy the eBook too, that’s cool, I understand. But buy the pulp. It wants you to hold it in your hands.